NEW ORLEANS, Louisiana, February 14, 2013 (ENS) – Transocean Deepwater Inc. pleaded guilty today to a violation of the Clean Water Act for its illegal conduct leading to the April 2010 Deepwater Horizon disaster in the Gulf of Mexico. The Swiss-based offshore contract drilling services corporation was sentenced to pay $400 million in criminal fines and penalties, U.S. Attorney General Eric Holder announced. During the guilty plea proceeding today, Transocean admitted that members of its crew onboard the Deepwater Horizon, acting at the direction of BP’s well site leaders, known as “company men,” were negligent in failing to investigate fully clear indications that the Macondo well was not secure and that oil and gas were flowing into the well. On April 20, 2010, there was an explosion and fire on the Deepwater Horizon semi-submersible Mobile Offshore Drilling Unit, which was owned and operated by Transocean and drilling for BP in the Macondo Prospect oil field about 40 miles southeast of the Louisiana coast. The explosion killed 11 workers and injured 16 others. The explosion caused the Deepwater Horizon to burn and sink, resulting in a massive offshore oil spill in the Gulf of Mexico, considered the largest accidental marine oil spill in the world, and the largest environmental disaster in U.S. history. Transocean’s guilty plea was accepted today, and the sentence was imposed by U.S. District Judge Jane Triche Milazzo of the Eastern District of Louisiana. During the guilty plea and sentencing proceeding, Judge Milazzo found, among other things, that the sentence appropriately reflects Transocean’s role in the offense conduct, and that the criminal payments directed to the National Academy of Sciences and National Fish and Wildlife Foundation are appropriately designed to help remedy the harm to the Gulf of Mexico caused by Transocean’s actions. The judge observed that the fines and five year probationary period provide just punishment and adequate deterrence. “The Deepwater Horizon explosion was a senseless tragedy that could have been avoided,” said Assistant Attorney General Lanny Breuer of the Justice Department’s Criminal Division. 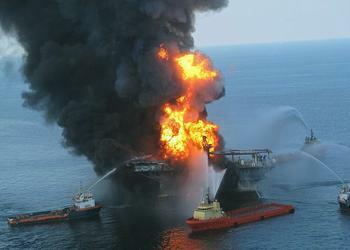 Under the order entered by the court in the plea agreement, $150 million of the $400 million criminal recovery is dedicated to acquiring, restoring, preserving and conserving – in consultation with appropriate state and other resource managers – the marine and coastal environments, ecosystems and bird and wildlife habitat in the Gulf of Mexico and bordering states harmed by the Deepwater Horizon oil spill. This portion of the criminal recovery will also be directed to barrier island restoration and/or river diversion off the coast of Louisiana to further benefit and improve coastal wetlands affected by the spill. An additional $150 million will be used to fund improved oil spill prevention and response efforts in the Gulf of Mexico through research, development, education and training. Transocean was also sentenced to five years of probation, the maximum term of probation permitted by law. A separate proposed civil consent decree, which resolves the United States’ civil Clean Water Act penalty claims, imposes a record $1 billion civil Clean Water Act penalty, and requires significant measures to improve performance and prevent recurrence. This consent decree is pending before U.S. District Judge Carl Barbier of the Eastern District of Louisiana. The guilty plea and sentencing announced today are part of the ongoing criminal investigation by the Deepwater Horizon Task Force into matters related to the April 2010 Gulf oil spill. The Deepwater Horizon Task Force, based in New Orleans, is supervised by Assistant Attorney General Breuer and led by Deputy Assistant Attorney General John Buretta, who serves as the director of the task force. The task force includes prosecutors from the Criminal Division and the Environment and Natural Resources Division of the Department of Justice; the U.S. Attorney’s Office for the Eastern District of Louisiana, as well as other U.S. Attorneys’ Offices; and investigating agents from: the FBI; Environmental Protection Agency, Criminal Investigative Division; Office of Inspector General; Department of Interior, Office of Inspector General; National Oceanic and Atmospheric Administration, Office of Law Enforcement; U.S. Coast Guard; U.S. Fish and Wildlife Service; and the Louisiana Department of Environmental Quality.